STINGRAYS CAN JOIN YOUR ADVENTURE! Gliding through the water like majestic birds in the air, they are gentle creatures. In the wild, stingrays spend most of their lives buried in the sand out of the view of predators and divers. At the Aquarium they relish the spotlight, and will even eat out of the hands of our divers! Watch as divers enter the tank and hand feed these large, but gentle giants. At the shallow end of the tank visitors may take the opportunity to touch and get up close and personal with one of these beautiful animals. Native to the Atlantic Ocean, the Cownose Ray is a schooling ray that can be found in large groups of thousands at a time. These rays are golden or tan in color and can reach lengths of 4 feet in wingspan and grow up to 36 pounds. They are bottom feeders and use the flaps surrounding their mouths to dig through the sand to locate buried prey such as clams, mussels, and oysters. Swimmers often mistake their pectoral fins as shark fins when they break the surface of the water. The Spotted Eagle Ray can be easily identified with its unique rounded snout and white polka-dots along its dark purple colored back. They can reach a length of 16 feet and a wing span of 10 feet when fully grown. Their crescent shaped teeth are used to grind up shrimp, crabs, squid, and small fish. They are schooling rays and can usually be found in large groups worldwide in tropical and temperate waters. 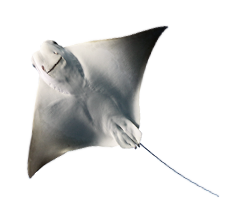 These rays are a Near Threatened species on the IUCN Red List of Threatened Species. Like all stingrays, they have anywhere from 1-6 venomous spines with serrated barbs located along the base of the tail. these barbs are only used as a means of passive defense. Southern Stingrays often visit cleaning stations where bluehead wrasses and Spanish hogfish will eat the parasites and mucus from the stingray’s bodies. These rays can grow to over 6 feet in length and can be found along the west coast of the Atlantic Ocean. They prefer shallow coastal waters and typically hide under the sand. Related to the much larger and fiercer hammerhead shark, Bonnetheads are a small 4 foot long shallow water, coastal shark. 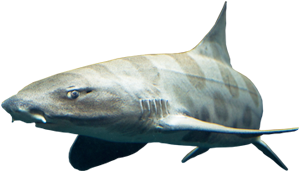 Bonnetheads are an active tropical sharks that swim in small groups of 5 to 15. Like hammerheads, Bonnetheads have their eyes at the end of their curved lateral head. This allows them to see in all directions and gives them increased depth perception. Typically measuring 3.9–4.9 ft long, this slender-bodied shark is immediately identifiable by the striking pattern of black saddle-like markings and large spots over its back. Large schools of leopard sharks are a common sight in bays and estuaries, swimming over sandy or muddy flats or rock-strewn areas near kelp beds and reefs. Experience the rays in the water. This unique experience takes you into Ray Bay where you will get up close and personal with our stingrays! Bring your bathing suit, because you’re getting wet!.